Students in the DACC Summer Camp race C02 cars Thursday. 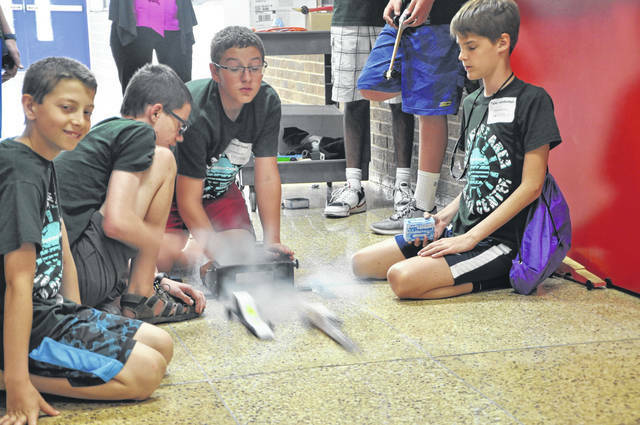 Instructor Tom Underwood said students were taught a lesson in aerodynamics over the course of the camp and were tasked with designing their own cars out of wood. Students did a number of heats Thursday to determine the fastest car in the class. Student Kevin Lin uses a torch to cut a section of pipe Wednesday under the supervision of DACC Instructor Robert Swonger. Learning to use the torch was just one of many skills Swonger tried to impart on students during the four-day course, and he said other lessons included tearing down and rebuilding an engine, some electrical work, and doing a tire rotation. The timer starts and two mechanics race off their lines to an engine, tools in hand, and begin unscrewing spark plugs from a cylinder head. Their hands move as quickly as possible as they take the spark plugs out of one side, stacking them on the engine before screwing them in on the other side. One mechanic is overzealous when his tool finds the spark plug and the plug breaks. “That’ll be a 15-second deduction,” says Robert Swonger. The first mechanic finishes and steps back to his line, another man standing by the engine hits a button on a stop watch and relays that time to a time-keeper. The second mechanic finishes and has his time recorded as well. A few other mechanics let out high-pitched screams after the scores are read, and Swonger winces, having grown accustomed to the sounds of teenagers, not middle school students. 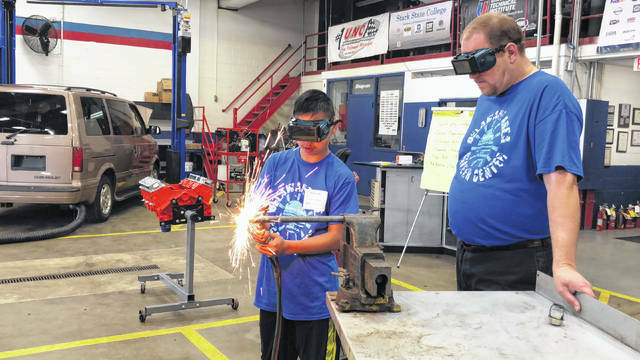 This was the scene at the Delaware Area Career Center North Campus Thursday during the last day of the DACC Summer Camp for local middle school students. Swonger, an instructor at the career center, spent the week giving a basic course called “Automotive Career & Exploration,” which covered various tools, mechanical parts, tearing down and rebuilding an engine, doing a tire rotation, and learning a few basic repair techniques. Swonger said teaching the students how to use various tools was a great way to build their dexterity because the students are using muscles and doing motions they would normally never use. Swonger said he hoped the students learned a lot doing the course, and he hoped the course “took the mystery out of it” and brought repairs to an easier-to-understand level. Luke Border, an Olentangy Orange Middle School student in the course, said he enjoyed the spark plug challenge and the course in general. In addition to Swonger’s course, the DACC Summer Camp also included a C02 racing course where students learned about aerodynamics, and designed and built their own wooden C02 cars. They spent Thursday afternoon racing them. The summer camp also offered a “Hands-On Science” course where students performed a number of experiments, including building roller coasters for marbles, and creating and running through a gooey substance called Gak. Instructor Emily Hardy said she hoped students learned that science “wasn’t just something you do behind a desk,” and she hoped the students had fun.